So there’s a possibility, a slim possibility but a possibility nonetheless, that there may just be 9 planets in the solar system after all. Pluto was originally discovered on the basis that the orbits of Neptune and Uranus appeared to be slightly perturbed. 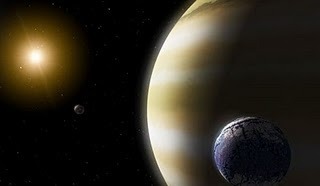 The discovery of Pluto seemed to fit the bill at the time (if someone’s looking for a planet, then whatever they find is going to be that planet), but as it happens, puny little Pluto didn’t have enough gravity to perturb an ice giant like Neptune. People lived and died searching for the mysterious “Planet X”, as it was known* which they believed to be lurking somewhere out past Neptune’s orbit. Strangely enough, it seems such a massive planet might just exist after all. Well, it’s not impossible anyway. the idea has been most recently championed by two scientists based in Louisiana. Dubbed Tyche, this distant member of the Sun’s family may be up to four times as massive as Jupiter, and may even have formed around another star and been captured by the Sun’s gravity. An adopted member of the family, then. Tyche has been hypothesised to exist due to irregularities seen in long period comets. Remember the Oort cloud? It’s a hypothetical spherical shell containing billions of comets, extending up to a light year away from the Sun. Occasionally another nearby star disturbs the slumbering comets with a faint gravitational tug. The influence is tiny, but it’s enough to send the comet falling inwards towards the Sun. But supposing there was more than just the gravitational influence of other stars. Supposing some massive, as yet unseen planet was joining in? Massive, silent and wraithlike, lurking unseen in the darkness. NASA’s WISE (Wide-field Infrared Survey Explorer) mission is currently on the lookout for such an object, just in case it happens to exist. If it did, it may be around 200K in temperature, which means that while it may be faint, it should be visible to a sufficiently sensitive infrared telescope. With an estimated distance of a staggering 15000 AU (that’s an orbital radius of nearly a quarter of a light year! ), it would explain why it’s managed to elude our attention thus far. If it exists. There are some who are rightfully skeptical of the idea. Actually, there are many. And that’s good. As fun as it may be to speculate, science demands facts. Because this is an extraordinary claim, and it does require extraordinary evidence — and no such evidence yet exists. It can’t yet be ruled out, but it can’t be taken as fact yet either. If such a planet did exist though, it would be very likely to have a system of moons, deep frozen on the very edge of interstellar space. This system of worlds would be very different to anything we currently know in the solar system. It may be closer in nature to an interstellar planet. There are a few reasons other than comets to imply that there may be something else lurking in the far reaches of the Sun’s gravitational influence. Just as the discovery of Pluto was prompted by peculiarities in Neptune’s orbit, the unofficial dwarf planet Sedna also has a very peculiar orbit. A gravitational perturbation could explain it. Also, there’s the unexplained Kuiper cliff — the Kuiper belt is the outer solar system’s version of the asteroid belt. It starts just outside the orbit of Neptune and extends to about 55 AU, where it suddenly stops. Either this is the outer edge of the belt, or the start of a broad gap in the belt, but either way such a gap is usually thought to be caused by some kind of object gravitationally sweeping the belt away. A hitherto unseen planet has been proposed as a cause of the Kuiper cliff before, but to date, the exact cause is unknown. In the meantime, until WISE can prove or disprove the existence of any extra planets in the Solar system, we’re just going to have to wait. * I’m loath to even give Google these keywords to index, but… I’m going to state quite plainly right here, that this is nothing to do with any 2012 armageddon planet-with-wings Nibiru bullsh*t. The original term “Planet X” was coined by Percival Lowell to refer to an unknown planet, before it was subverted by the unique form of lunacy that seems to run rampant in certain corners of the internet. And for the record? “Nibiru” was what the Babylonians called the planet we call Jupiter. That is all.